We’re proud of our prestigious partners. 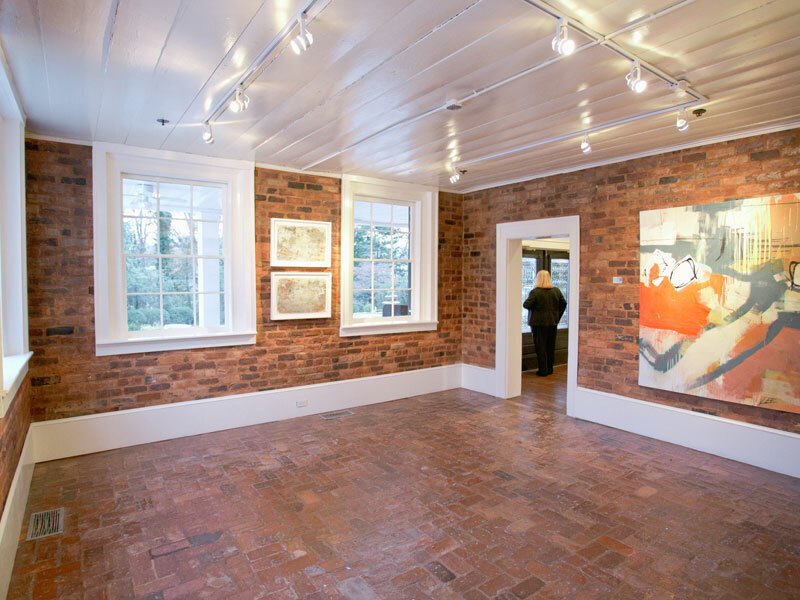 You'll be captivated by the hand-selected art from The Bill Lowe Gallery. Outside, you’ll enjoy the manicured and lush landscaping. Leading the way, Estate’s venue sales team is standing by ready to assist you. Our seasoned and talented Legendary Event representatives handle all the bookings and event inquiries at this location. Escape from the hustle and bustle of Buckhead by passing through our stately black wrought iron gates. Fig Oak and Magnolia trees frame the circular driveway as it curves around gently to expose the beauty of The Estate in all its glory. Welcome to The Estate, the 2013 winner of The Buckhead Beautification Award, a prestigious award given by the Buckhead Business Association. Once you pass through our stately wrought iron gates, expect to be instantly transported away from the city and into the peacefulness of our three acre hidden jewel. 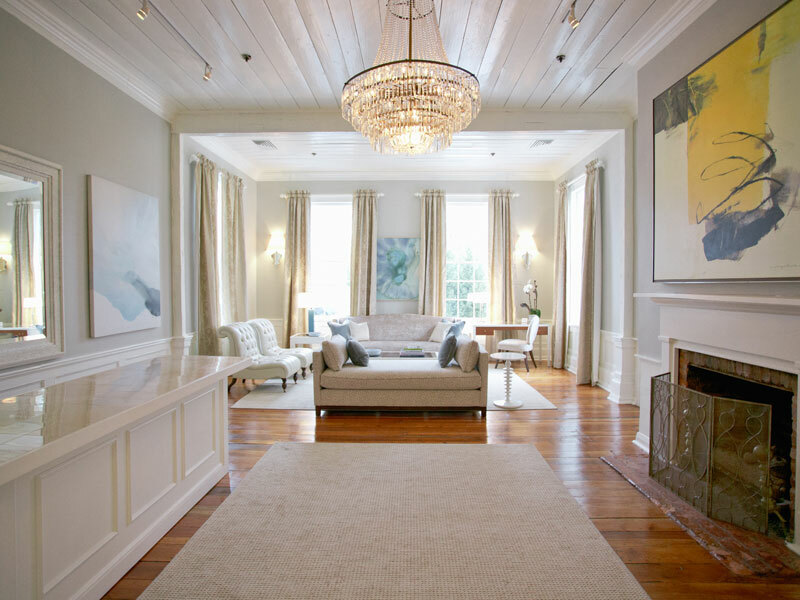 The Estate combines the best of southern charm with all the stylish amenities and comfort needed to make your event an unforgettable success. An icon of grace and sheer elegance, The Estate returns us to splendor. 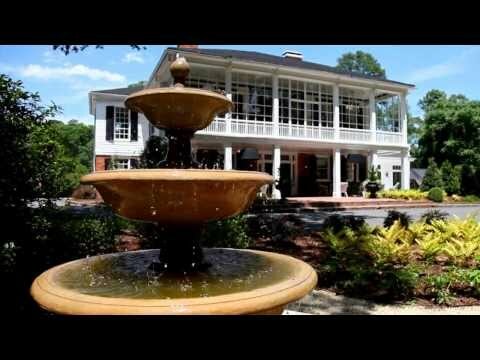 This magnificent authentic antebellum mansion offers all the charm and allure of the era in which it was built. Now updated and modernized, it proudly stands in the heart of Buckhead. Built in 1797 in Wilkes County, GA., it was very carefully moved brick by brick and rebuilt on Piedmont road where it resides today. 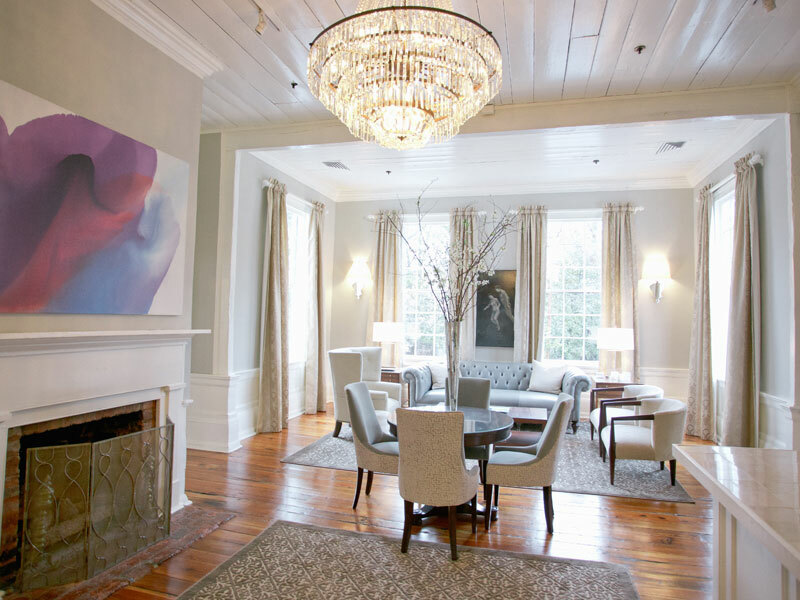 Under the attention and care of Tony Conway, CEO and Founder, and his team of talent at Legendary Events, The Estate was re-opened in mid-2012 and redecorated in a modern fashion that blends perfectly with the old Southern warmth of a grand home. 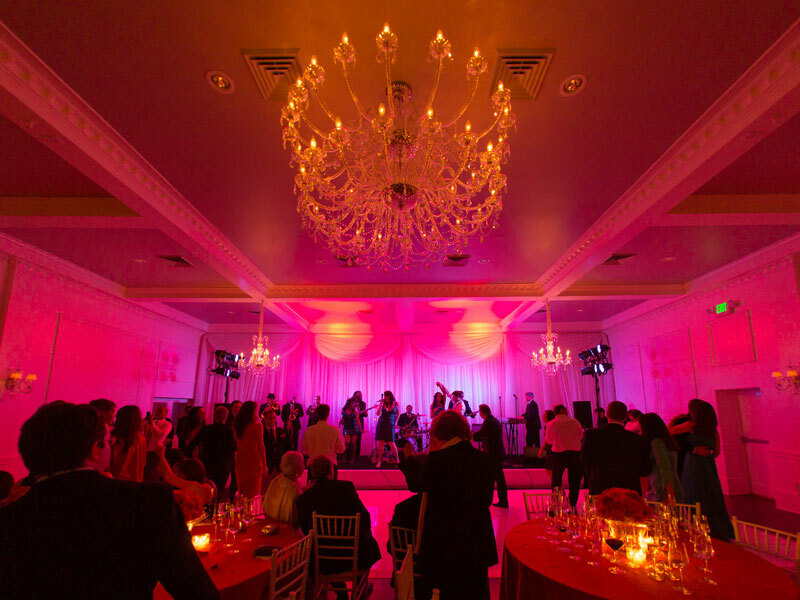 Add the new addition of a gorgeous ballroom and the renovation that meticulously cared for every detail, The Estate eagerly waits to be your next wedding or special event venue in Atlanta. Enter the house through beveled glass double doors and into the Grand Hallway on the first floor. You will be immediately struck by the grandeur of the staircase with the original balusters and attention to the fine details in the loving restoration of The Estate. 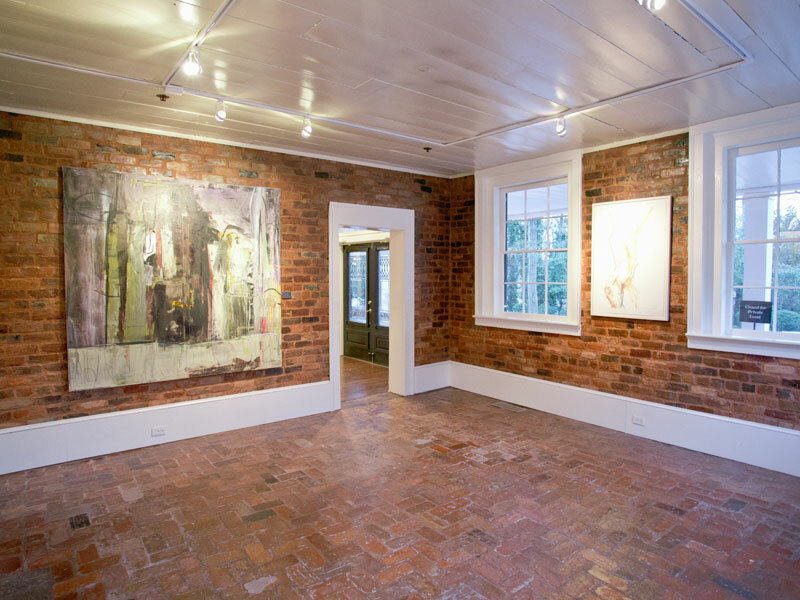 The original brick walls are adorned with artwork chosen exclusively for the venue. Each room possesses a working fireplace and beautiful furnishings to further draw you in. As you proceed up the grand staircase to the salons, discover the regal aura of each room designed by Mitchell Gold + Bob Williams. The front of the house is showcased by a glass encased sun porch with a fabulous view of the trees and lush landscaping. 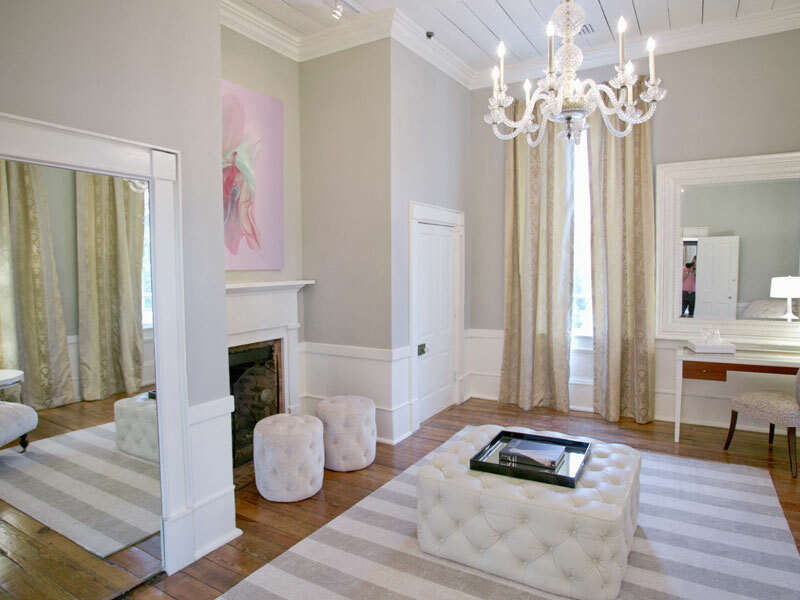 The Bride’s Room hosts a private powder room, a vanity, and full length mirrors. A baby grand piano begs to be played, artisan mahogany bars are stocked and ready for service, and crystal chandeliers glow overhead. Down a short flight of stairs from the foyer are the wine cellars. 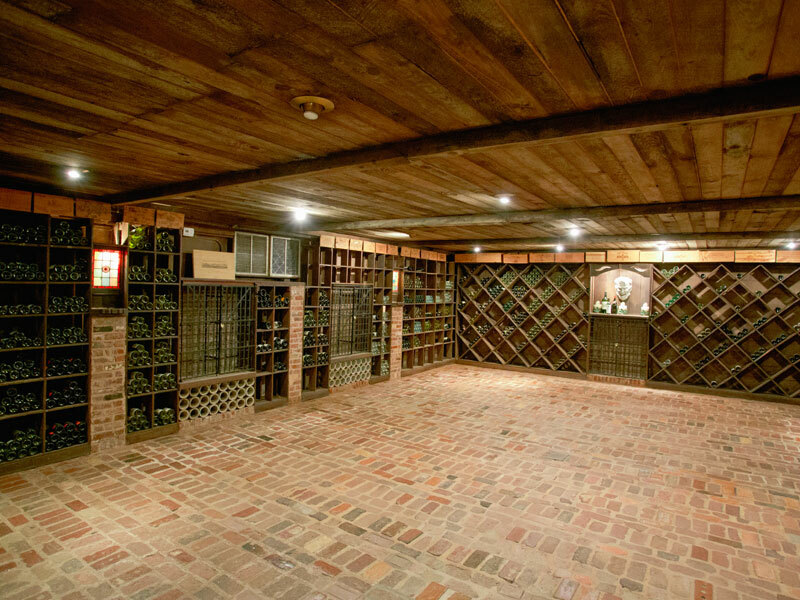 The two original cellars with stone flooring and subtle lighting create an intimate atmosphere. 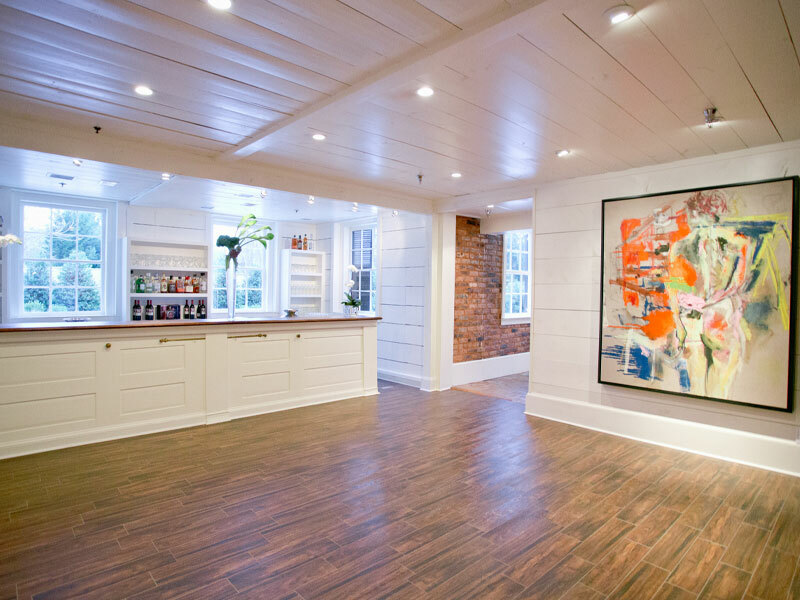 Back on the main level, enter the Main Gallery, complete with a craftsman built bar. The Ballroom is just off the gallery, where you will find a stunning crystal chandelier. 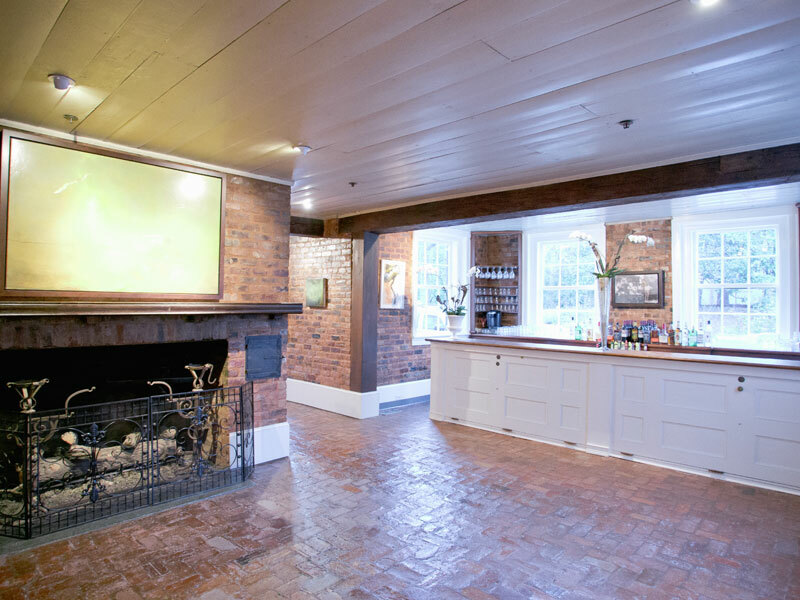 The polished plank pine flooring presents the perfect, elegant backdrop for a wedding reception or other special event. 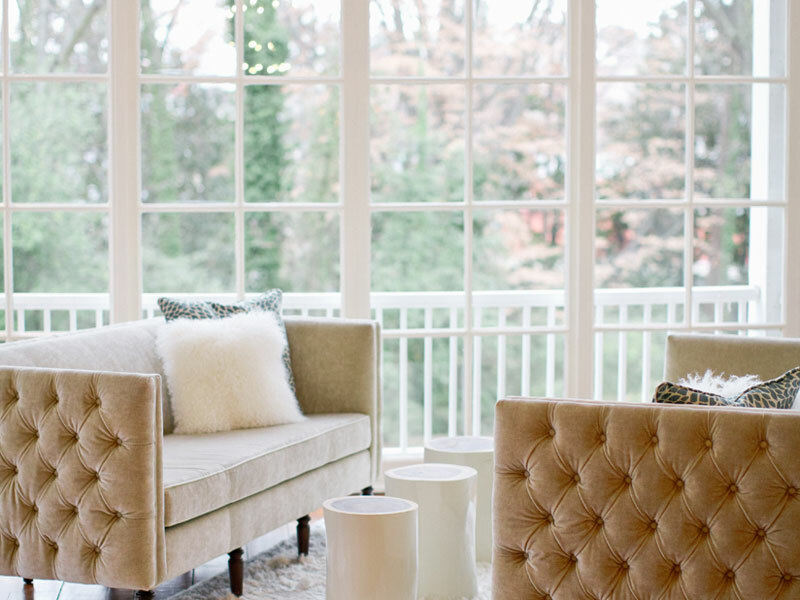 Come tour the most gorgeous reception venue in Atlanta! As you drive through the gate and down a pea gravel drive, the tall trees invite you to the mansion itself. A quaint fountain and lovely garden area directly in front of the building invites guests to ascend the steps to the front porch. Entering into the grand double doors into the foyer, one is immediately struck with the old-meeting-new charm of this refined location. On the main level, there are two bars and two spacious open salons for greeting guests. 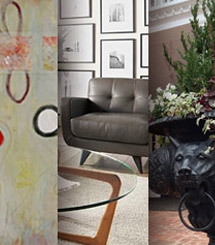 Each of these salons hosts specifically chosen custom artwork and a fireplace. Further inside stands the grand, high-ceiling ballroom, an ideal event space, decorated with elegant trimming on the walls and a beautiful custom-made crystal chandelier in the middle of the ceiling. Down a few more stairs are the handsomely detailed vintage stone wine cellars. 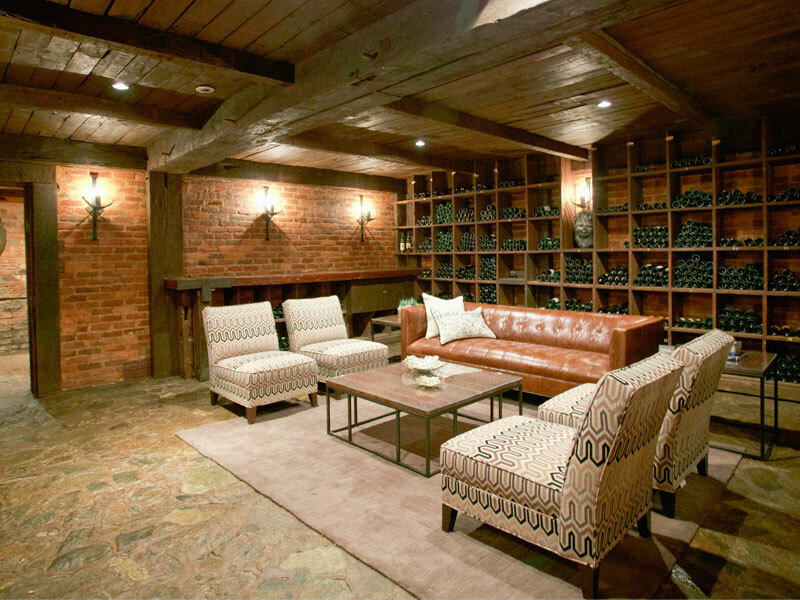 Intimately placed lighting and creative design have transformed these old cellars into modern lounge areas, perfect for mingling over cocktails. Climbing the grand staircase in the foyer, one can find gorgeously decorated salons designed and decorated for comfort and enjoying the atmosphere. Towards the front on this second level, there is a beautiful sun porch lounge space surrounded by windows that give a breathtaking view of the front grounds of The Estate. 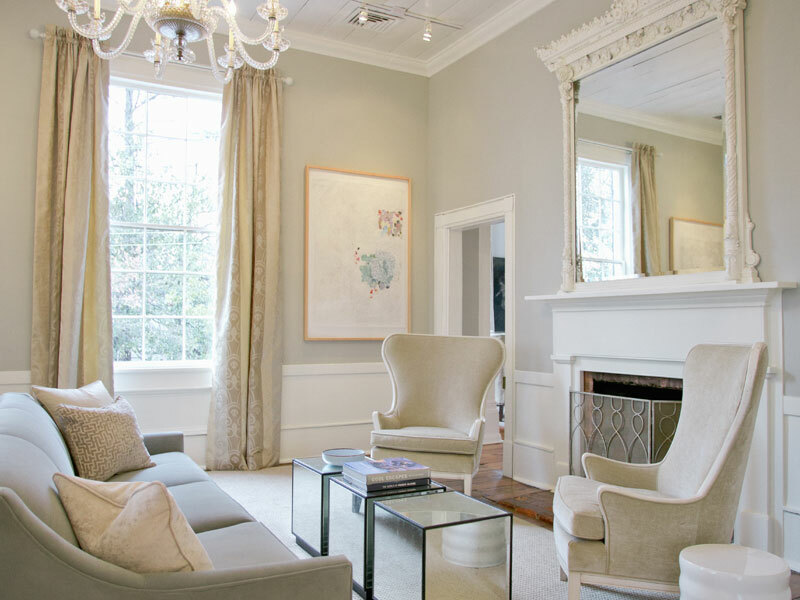 Watch from cozy lounge couches and chairs through the massive windows as your guests arrive at your event. 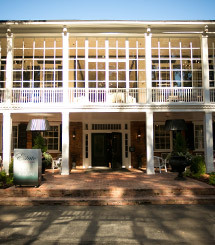 With ample space on either side of the mansion for valet parking, The Estate is surrounded by lush trees, creating a bubble of Southern paradise for your event within the hustle and bustle of Buckhead. Weather permitting wedding ceremonies can take place in front of the house beside a beautiful fountain with tall high trees adding to the romantic all-inclusive atmosphere. ©2016, The Estate, By Legendary Events. All Rights Reserved.